after thinking about this on and off for the last few weeks, I just threw the 30 minute daily goal out the window. I had mentally written a blog post for today explaining how much work I had to do to get my average back over 30 minutes after a short run (no running allowed in that area. Where it was allowed was too crowded) but then I further asked myself why. As I’ve been working my way back from injury – and pleased to report that the shoes are still magic two weeks in – I’ve been thinking and obsessing more about that thirty minute goal. I was still annoyed two weeks later about how a good run that knocked me under thirty minutes still bothered me goal wise. That’s ridiculous. What flipped the switch? A really good start to today’s run. About a half mile in I realized I was under 10 minute pace. Um, I don’t run that fast, I’m a turtle. Except, maybe I do? I realized after I took the four days off when my foot first hurt badly that I really hadn’t lost any fitness. My 5K times quickly rebounded and running felt good in better shoes. (I also took my advice and started wearing better commuting shoes. SO. MUCH. BETTER. Fitflops are seriously amazing for the plantar fasciitis, dreading end of sandal season). I also found that this month, humid runs aside, was much faster. 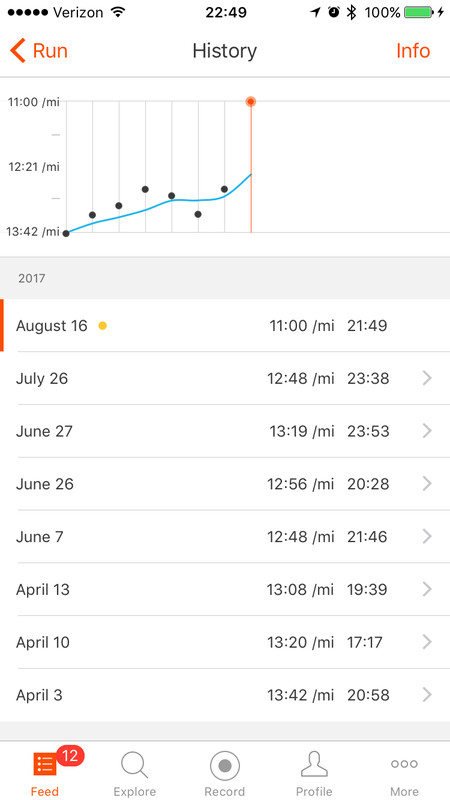 So I decided rather than trying to chase pace and time, I’d focus on pace (yes, I should have listened to myself in June!). I also think that some of the “must get to thirty minutes” run extensions were the time equivalent of junk mileage and while they didn’t cause this summer’s injuries, they didn’t help them. What also facilitated this? I’m not doing this month’s five miler or the Bronx ten miler as I didn’t think I could do either without reinjuring myself so I’m focusing on training for an October 10K and doing it properly. I’m going to leave the thirty minute goal there as I’d like to work toward it and because some of the 10K training will take me there, but I’m not going to let it rule my workout plans. So what am I going to do? I found the ASICS Pace Academy progression too quick for my abilities (much like initial Couch to 5K), but my pace seems to be at the Workout 3 where I left it, so I’m going to try to pick it up there and see where it takes me. It doesn’t align well with the 10K training but may work for the speed workouts, so we’ll see. 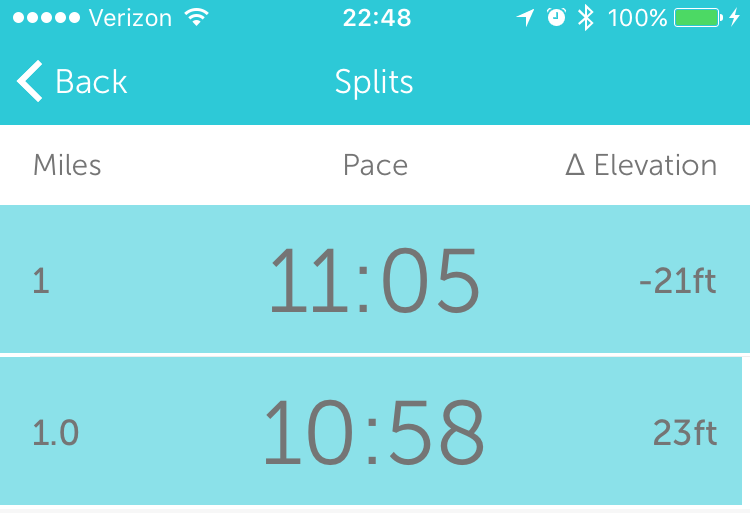 Speaking of where it takes me… Today’s run that was under ten minute mile at the half mile marker? 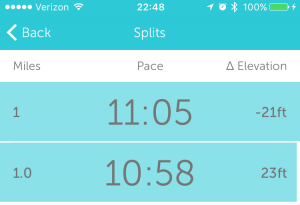 Whoa, where did that pace come from? Strava is drunk with its rounding down. 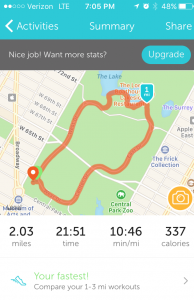 Runkeeper sees TomTom’s 2.03, Strava fail. Why did I include this? 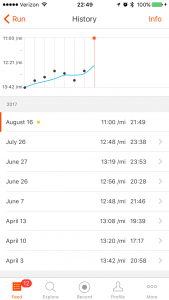 Because I love how Strava tracks the route over time and even if it’s not an exact alignment with RunKeeper, it shows my improved speed and why I think focusing on pace is the right move here. Speaking of time and pace, as they stand today with the fast and short workouts of the past week: 27:56 and 12:09. That’s almost 44 seconds faster than July. I love early gains. We’ll see where this takes me. Mean time, I’m smiling.